Six years ago today I was flying back from my first serious bucket list excursion - a mountain climbing expedition to Peru and Bolivia. Back then (I was 58) my bucket list was just in my head and I had focused on just one item--climb a 20,000 foot mountain. As it turns out, the trip was probably more memorable for another classic bucket list item, but I'll reserve that for another post. 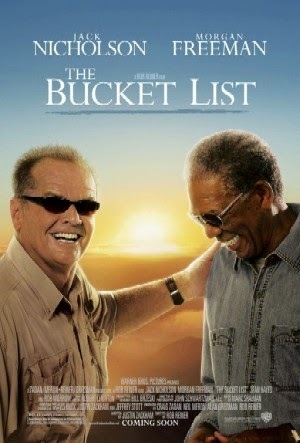 A year after I got back from Bolivia the 'Bucket List' movie came out, and modern Bucket List mania began. I absolutely loved the movie. Morgan Freeman is like a minor god to me (in fact I want him to star as First Prince Mbele in the film adaptation of my novel 'Eden's Womb'.) But even with all the buzz about the topic at the time, I still didn't establish a formal bucket list; and the 'state of the list' hasn't changed since - until yesterday when I started going back through the photos of the Bolivia trip, reminiscing, and contemplating my upcoming 65th birthday. So I thought I'd finally get serious about this formal bucket list thing. I Googled a few web sites for bucket list ideas, searched some 'seven wonders of the world' web sites, etc., and came up with my first draft list. Bucket Lists are, of course, very personal. But I found that reading other people's lists provided inspiration and ideas for my own. And to my surprise, things that I had done but had never really considered to be bucket list items showed up on some of these lists. That was encouraging - suddenly I realized that I've been a closet 'bucket lister' for most of my life. Then extend my Personal Continuous Footpath to every one of the 49 continental US states and to the Arctic Ocean at Tuktoyaktuk, Northwest Territories (they are building the road). Witness a total solar eclipse (Montana, February 26, 1979). See this post for more info. Visit Machu Picchu. (May 31, 2007) See the report here.